A ruptured aneurysmatic fistula of the coronary sinus has been considered a very rare cardiac lesion. The treatment of choice of such fistulae is a surgical repair, but with the recent advances in the transcatheter treatment of the left to right shunts by occluder devices, the non-surgical treatment of coronary sinus fistulae is increasing. We present a case of transcatheter treatment of right coronary aortic sinus of Valsalva to the right ventricle (RCAS-RV) fistula using Amplatzer duct occluder (ADO). A 22-year-old man was referred for evaluation of exertional fatigue. He was previously diagnosed with a ventricular septal defect (VSD). He was not on any medical therapy. On examination, there were no overt signs of congestive heart failure. A systolic precordial thrill was palpable and a harsh 5/6 continuous murmur was audible. The pulse was high volume with blood pressure of 135/65 mmHg. Electrocardiogram (ECG) demonstrated sinus rhythm and incomplete right bundle branch block. 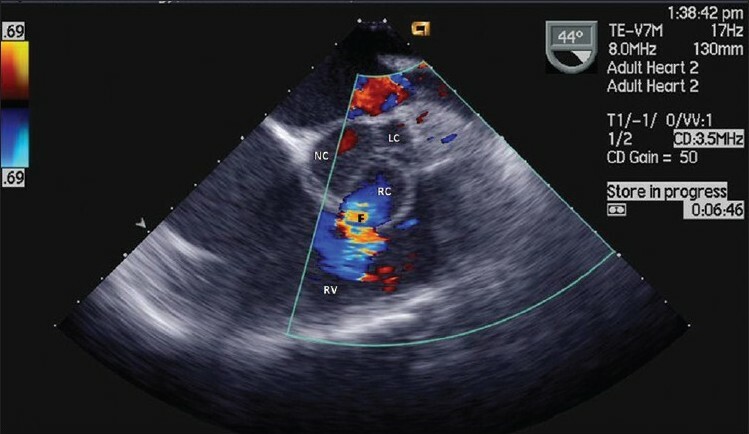 Transthoracic echocardiography (TTE) revealed normal situs and connections with marked left ventricular (LV) enlargement; LV end diastolic/end systolic dimensions (LVEDd/LVESd) were 62/33 mm. No hypertrophy and no regional wall motion anomalies were noted and there was hyperactive LV function with LV fractional shortening of 47%. A sizable fistula with a large flow was detected shunting from RCAS-RV. There was no VSD or aortic valve regurgitation (AR). The patient was scheduled for cardiac catheterization under transesophageal echo (TEE) guidance. The procedure was performed under general anesthesia with endotracheal intubation. The TEE interrogation disclosed an 8-mm fistula confirming the TTE findings [Figure 1]a and [Figure 2]. A hemodynamic evaluation was performed with a normal pulmonary artery (PA) pressure 30/4 (15) mmHg and a QP/QS ratio of 3:1. The right anterior oblique projection aortogram illustrated the RCAS-RV irregular fistula which measured 8 mm in the aortic orifice and 9 mm in the mid portion. An arterio-venous loop was established by retrograde crossing of the fistula using a 0.025" Terumo guidewire (Terumo Medical Corporation, Somerset, NJ, USA) from the aorta to the RV followed by a multipurpose (MP) 5F catheter (Cordis, Miami, FL, USA). At this stage, a noodle wire (NW) (AGA Medical Corporation, Golden Valley, MN, USA) was introduced and was snared out from the pulmonary artery (PA) via the inferior vena cava (IVC) through the femoral vein using a 15-mm pfm snare (Produkte fur die Medizin AG. Cologne, Germany). An AGA 7F delivery sheath (AGADS) was introduced through the femoral vein to join the MP catheter in the IVC. The assembly of the MP with the AGADS was gently pushed over the NW to the level of the aortic arch. A 12 Χ 10 mm Amplatzer Duct Occluder (ADO) (AGA Medical Corporation, Golden Valley, MN, USA) was loaded into the AGADS with careful deairing of the system and the whole system was withdrawn to the ascending aorta. The ADO was partially deployed in the ascending aorta and the entire system was withdrawn to allow engagement of the 12-mm ADO disk with the aortic aspect of the RCAS-RV fistula. At that stage, the AGADS was further withdrawn to allow full deployment of the ADO. 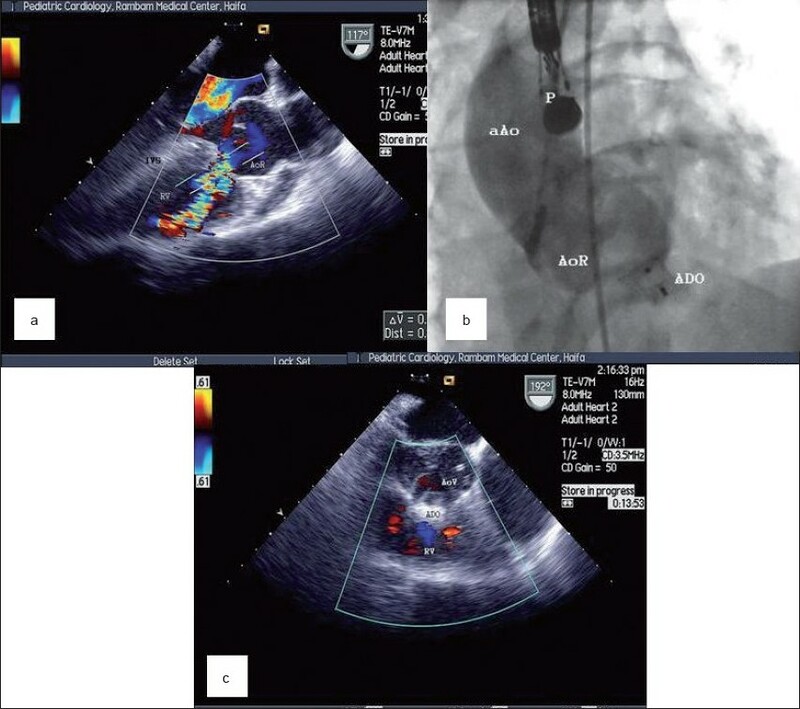 Following TEE evaluation of adequate ADO position and exclusion of AR, the ADO was released from the delivery system with TEE and aortogram confirming the final result [Figure 1]b and [Figure 3]. 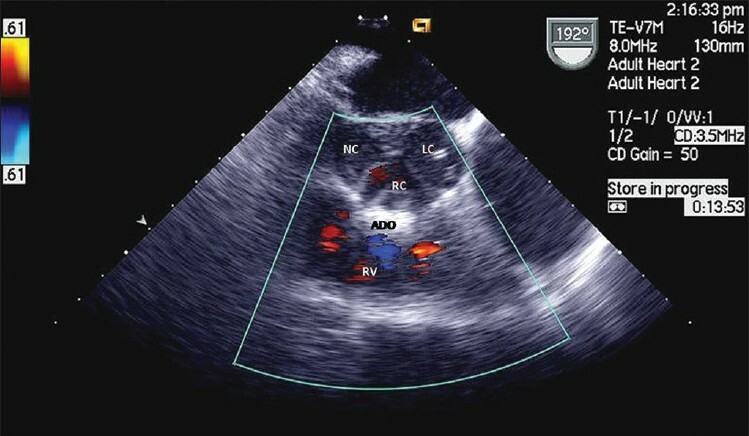 A trivial color-flow Doppler residual shunt was noted on TEE [Figure 1]c and ascending aortography, immediately after ADO release, but it vanished on an outpatient evaluation 10 days following the procedure. No peri-procedural complications were noted. A very good LV function was maintained with LVEDd/LVESd 49/30 mm and marked reduction of LV size. Treatment with acetylsalicylic acid 100 mg daily was initiated after the procedure for 6 months. Majority (77%) of the aneurysms of sinus of Valsalva arise from the right coronary sinus. The RV is the most common chamber of rupture (58%). The noncoronary sinus is affected in 28% of patients. About 20% of the noncoronary aneurysms rupture into RV, with only six cases being reported in two decades from a large center. ,No comparative data with a long-term follow up are available for surgical repair and transcatheter closure of the different types of fistulae. The technique of transcatheter closure of the RCAS-RV fistula presented here is proposed as an attractive alternative to surgery. The TEE or intravascular echo are mandatory modalities for adequate device deployment and release, avoiding complications such as inappropriate device position, device embolization, marked residual shunt and aortic valve regurgitation. The option of device retrieval and replacement by a more suitable one increases the safety and the efficacy of this percutaneous approach. A failure of the percutaneous approach necessitates surgical intervention for closure of the fistula. Long term comparative data with surgical repair are necessary before recommending transcatheter closure as the procedure of choice for these individuals. 1. Sawyers JL, Adams JE, Scott HW Jr. A method of surgical repair for ruptured aortic sinus aneurysms with aorticoatrial ﬁstula. South Med J 1957;50:1075-8. 2. Sung-Ho Jung, Tae-Jin Yun, Yu-Mi Im, Jeong-Jun Park, Hyun Song, Jae-Won Lee, et al. Ruptured sinus of Valsalva aneurysm: Transaortic repair may cause sinus of Valsalva distortion and aortic regurgitation. J Thorac Cardiovasc Surg 2008;135:1153-8. 3. Moustafa S, Mookadam F, Cooper L, Adam G, Zehr K, Stulak J, et al. Sinus of Valsalva aneurysms-47 years of a single center experience and systematic overview of published reports. Am J Cardiol 2007;99:1159-64. 4. Harkness JR, Fitton TP, Barreiro CJ, Alejo D, Gott VL, Baumgartner WA. A 32-Year experience with surgical repair of sinus of valsalva aneurysms. J Card Surg 2005;20:198-204. 5. Cullen S, Somerville J, Redington A. Transcatheter closure of a ruptured aneurysm of the sinus of Valsalva. Br Heart J 1994;71:479-80. 6. Fedson S, Jolly N, Lang RM, Hijazi ZM. Percutaneous closure of a ruptured sinus of Valsalva aneurysm using the Amplatzer Duct Occluder. Catheter Cardiovasc Interv 2003;58:406-11. 7. Arora R, Trehan V, Rangasetty UM, Mukhopadhyay S, Thakur AK, Kalra GS. Transcatheter closure of ruptured sinus of Valsalva aneurysm. J Interv Cardiol 2004;17:53-8. 8. Zhao SH, Yan CW, Zhu XY, Li JJ, Xu NX, Jiang SL, et al. Transcatheter occlusion of the ruptured sinus of Valsalva aneurysm with an Amplatzer duct occluder. Int J Cardiol 2007;129:81-5. 9. Bijulal S, Harikrishnan S, Ajitkumar VK. Nonsurgical closure of recurrent rupture of sinus of valsalva aneurysm in the presence of aortic prosthesis. J Invasive Cardiol 2009;21:E42-3. 10. Abidin N, Clarke B, Khattar RS. Percutaneous closure of ruptured sinus of Valsalva aneurysm using an amplatzer occluder device. Heart 2005;91:244. 11. Choudhary SK, Bhan A, Sharma R, Airan B, Kumar AS, Venugopal P. Sinus of valsalva aneurysms: 20 Years' Experience. J Card Surg 1997;12:300-8. 12. Barragry TP, Ring WS, Moller JH, Lillehei CW. 15- to 30-year follow-up of patients undergoing repair of ruptured congenital aneurysms of the sinus of Valsalva. Ann Thorac Surg 1988;46:515-9. 13. Takach TJ, Reul GJ, Duncan JM, Cooley DA, Livesay JJ, Ott DA, et al. Sinus of Valsalva aneurysm or fistula: Management and Outcome. Ann Thorac Surg 1999;68:1573-7. Ribeiro, M.S., Pereira, F.L., Costa, R.N., Arruda, A., Braga, S., Fontes, V.F., Pedra, C.A.C.